One issue that unites millions of voters is their disgust for big-money politics and their hatred of misleading, negative political advertising. When I go door-to-door with my campaign flier, I introduce myself as a progressive Democrat (which usually gets a smile and a nod) and a Clean Elections candidate (which brightens their eyes and widens their smiles). Voters are fed up with big-money politics and lies. 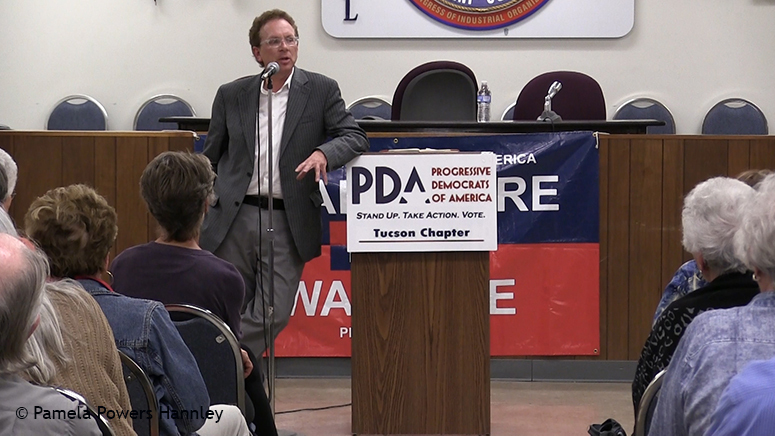 Earlier today, I was looking for a video on my Tucson Progressive YouTube Channel and found this clip from a speech that John Nichols of “The Nation” gave in Tucson in March 2015 at a Progressive Democrats of America event. In this clip (below), Nichols theorizes that the negative advertising itself suppresses voter turnout. He reports that $10 billion was spent on political advertising in 2012 and 90% of it was negative advertising to disparage candidates. In 2014, with continued negative advertising, the US had the lowest voter turnout since 1942– during World War II. If $10 billion was wasted on political advertising in 2012, what will be spent in 2016? If we want to save our democracy, we must get money out of politics. If rich folks have enough expendable income to waste $10 billion on advertising, I think they can afford to pay higher taxes. This entry was posted on July 31, 2016 by Pamela Powers Hannley in 2012 elections, 2016 elections, Arizona, Arizona Legislature, Austerity, campaign financing, Clean Elections, Pamela Powers Hannley, Trickle Down Economics, Video and tagged Citizens United, Clean Elections, John Nichols, PDA Tucson, Progressive Democrats of America.